Barnaby Castle, constructed in 1875, has always been known as a uniquely flamboyant structure, replete with a copper-clad circular conservatory, grand 4-story tower, and carriage house. In the 19th century, the prominent Barnaby’s, Jerothmul and Josephine, called the fanciful Modern Victorian “castle” a home. Jerothmul was a self-made millionaire and political figure: a prominent clothier, he served on City Council, in the General Assembly and played a role in the state’s Democratic party. But today he is probably best known due to the murder of his wife who died just two years after he did. In 1891 Josephine had the rare distinction as the country’s first victim of murder by US mail: she drank from a bottle of poisoned whiskey that had been sent to her. There were multiple suspects – a friend, a politician, a doctor, and the doctor’s wife – but the mystery of who sent the lethal package was never fully solved. Currently in the lengthy process of restoration, today Providence’s grandest mansion is finding new life as one of the city’s best event venues. 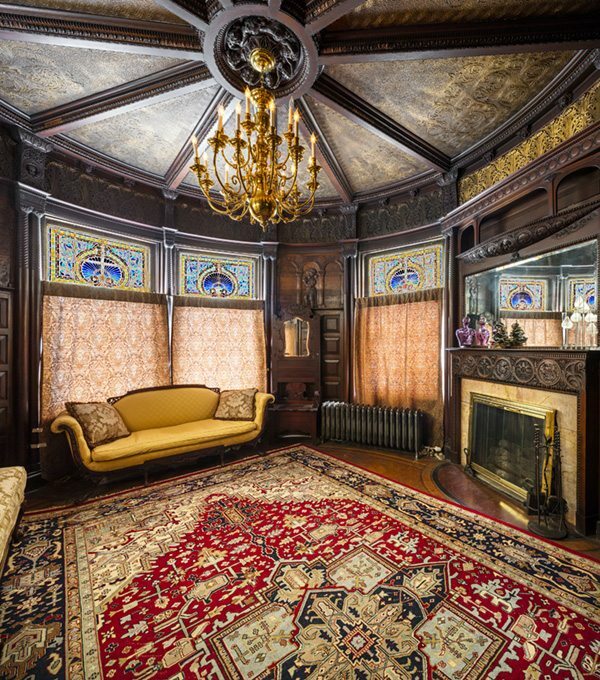 Explore the opulent interiors of Providence’s grandest Victorian mansion. To learn more about hosting your own event at Barnaby Castle and becoming a partner in its preservation, visit the Barnaby Castle Facebook Page or Kaitlyn Frolich’s website. Follow @doorsopenri for Festival news!